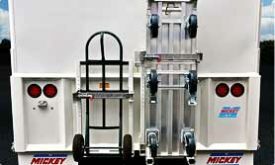 Mickey Truck Bodies is the leading supplier of parts in terms of availability and service. We offer a large inventory of stock parts for same-day shipping on all orders received by 2 PM, and all fabricated parts are shipped within one to three working days. Parts are available from Mickey’s main manufacturing facility in High Point, NC as well as from any of its regional Reconditioning and Service Centers located throughout the country. Any part that is received damaged, or is not the exact part ordered, will be replaced and shipped the day of notification at no charge, with no questions asked.